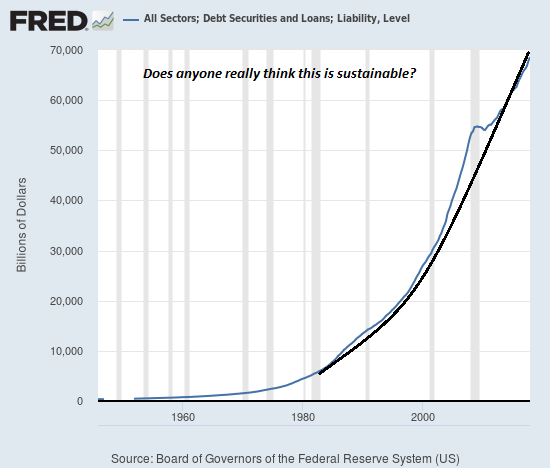 Home / Humble student of the markets / Can America still lead the world? A picture is worth a thousand words. 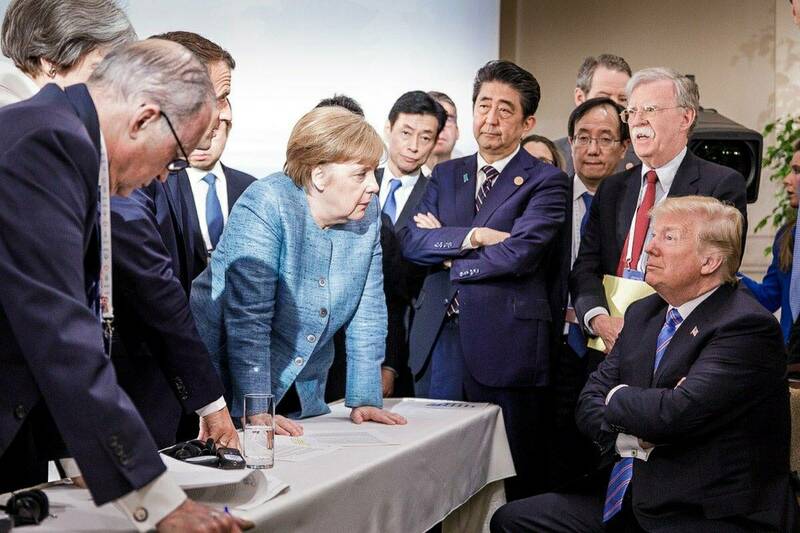 In light of the visible divisions at the G7 meeting, the question of whether America can continue to lead the world sounds out of place. The question takes on a different context from an equity investor’s viewpoint. 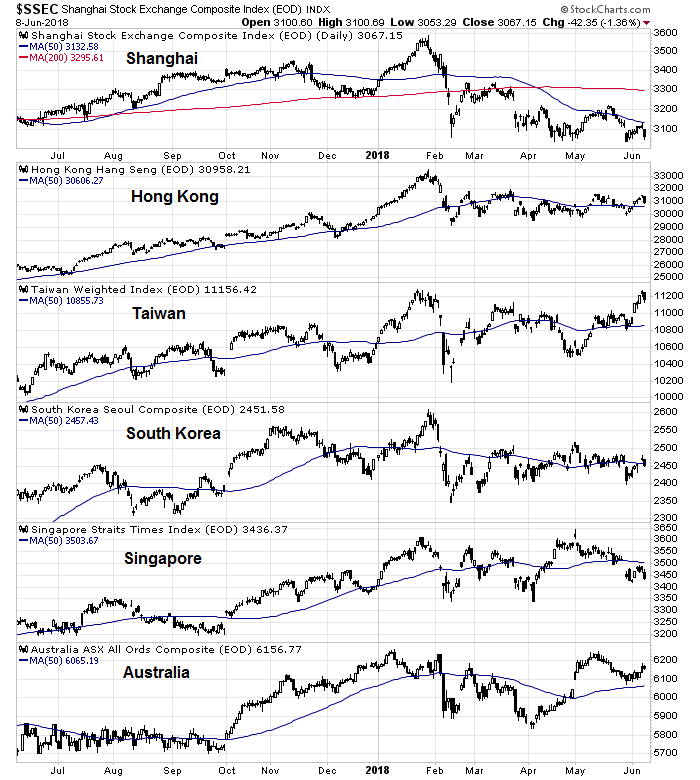 The chart below shows that US stocks have been the only source of market leadership, which begs the question, “Can global stocks achieve new highs with only US stocks?” The chart below compares US, international developed markets (EAFE), and emerging market (EM) equities to the MSCI All-Country World Index (ACWI). US equities have been tracing out a saucer shaped base on a relative basis. EAFE have been weak in the past year, and they are testing a key relative support level. EM relative performance began to falter in late 2017, and relative strength has been rolling over. Put it another way, can the other regions recover some of their mojo in order to propel global equities to new all-time highs? To answer that question, we take a tour around the world and analyze the macro and equity market outlooks of the three major trading blocs, the US, Europe, and China. The bull case for US equities is easy to make. 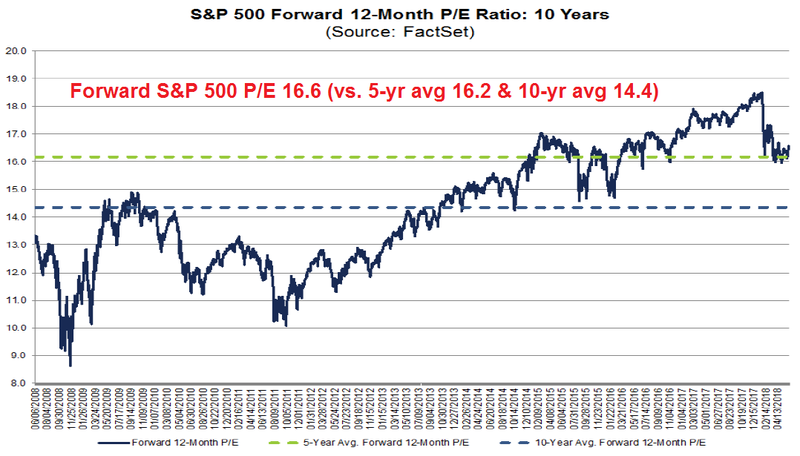 Valuations are not excessively, as the forward P/E of 16.6 is just above its five year average. 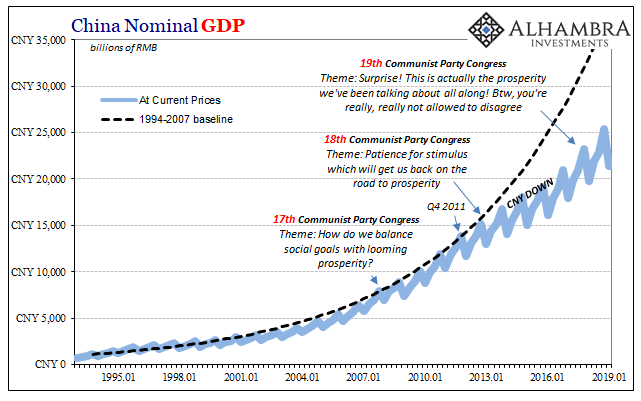 At the same time, fundamental momentum is positive from both a bottom-up and top-down viewpoint. 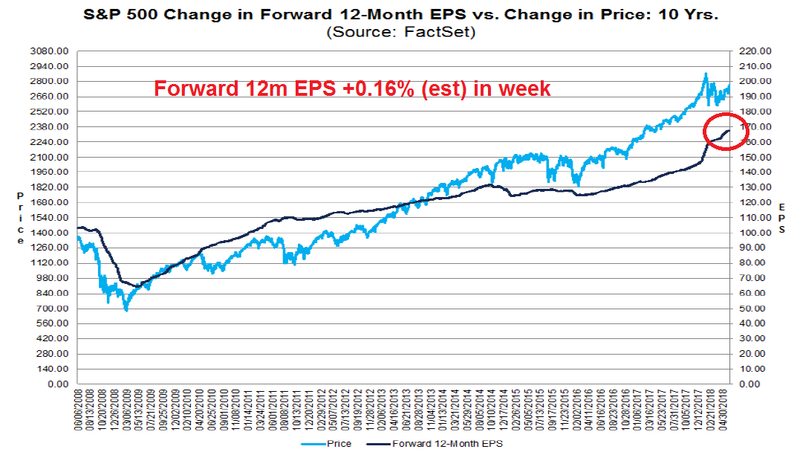 The latest update from FactSet shows that forward 12-month EPS is still rising steadily after the tax cut related surge. Recently I had a couple of different interactions with shrewd market watchers that have perked my antenna. When the first occurred, I filed it away – assuming it was a sampling quirk. But when my second buddy unbiddenly told a similar tale, I jumped up from my chair. Fast forward to my next buddy. He is an old-school small-cap equity value investor. He gets on planes to visit places most analysts wouldn’t be caught dead at to get a sense of management and see the operation in person. With all of his contacts, he gets a good sense of how small-town America is doing. During our chat over drinks, he passed along his observation that the US economy is “tight as drum.” Phones are ringing off the hook. Trucks leaving the plant with product full to the brim. Business owners can’t find enough staff. Things are hopping. Top-down momentum looks equally impressive. The Atlanta Fed’s Q2 GDP nowcast stands at an astounding 4.8%, the New York Fed’s GDP nowcast is 3.08%, and the St. Louis Fed’s GDP nowcast is 3.8%. 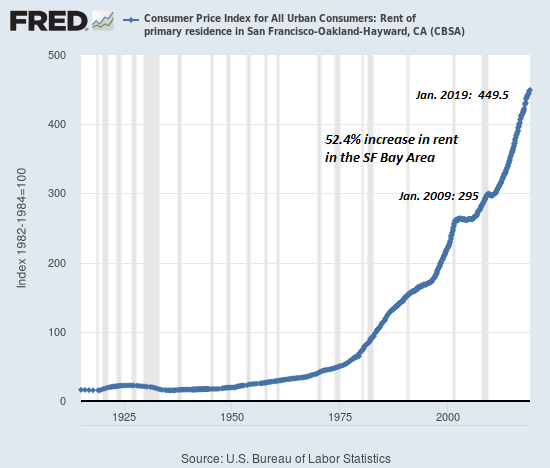 Any way you look at it, that’s strong growth. 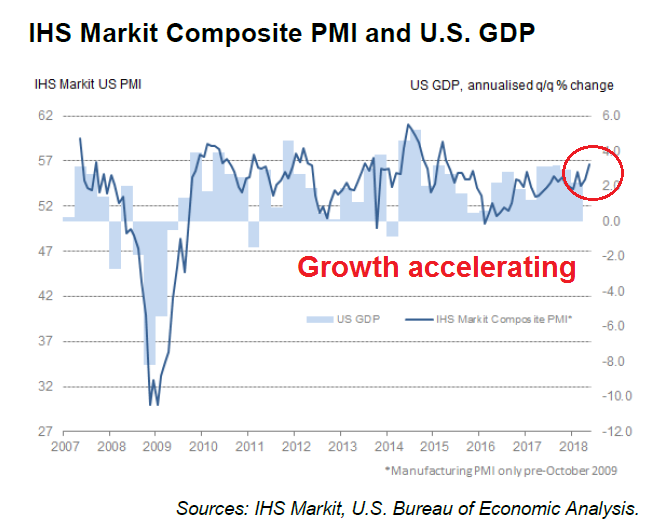 The growth acceleration is confirmed by the strength in the Markit Composite PMI. These strong fundamentals are reflected by a series of buy signals from insider activity, according to Barron’s. Investors on the watch for a bear market in global equities should keep their eyes on Europe, according to Gavekal Research. In addition, the latest Composite PMI is telling a story of a growth deceleration. All these negative have served to put pressure on the Euro STOXX 50, which is tracing out a rounded top (top panel). The relative performance against ACWI (bottom panel) appears equally dismal, with the index weakening and approaching a relative support zone. That said, these eurozone conditions are a contrarian’s dream. 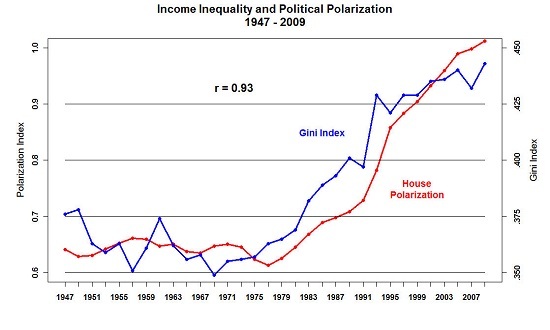 Things can’t get very much worse. 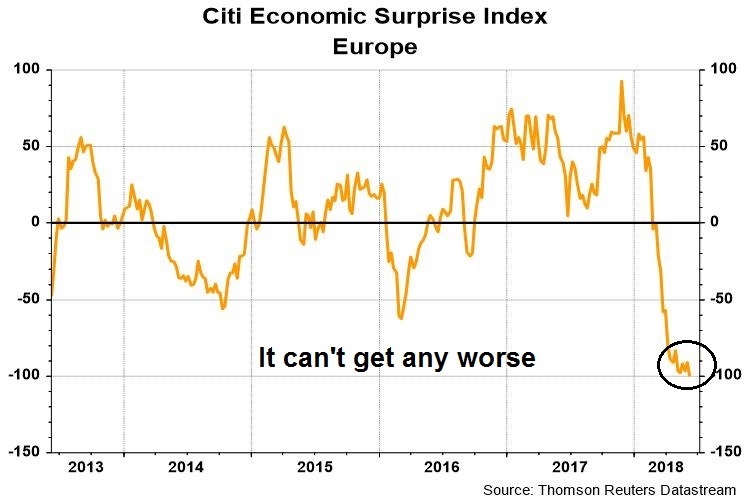 Consider, for example, the Europe Economic Surprise Index (ESI), which measures whether economic statistics are beating or missing expectations. The ESI is designed to be mean reverting, and readings at -100 are as bad as they can get. 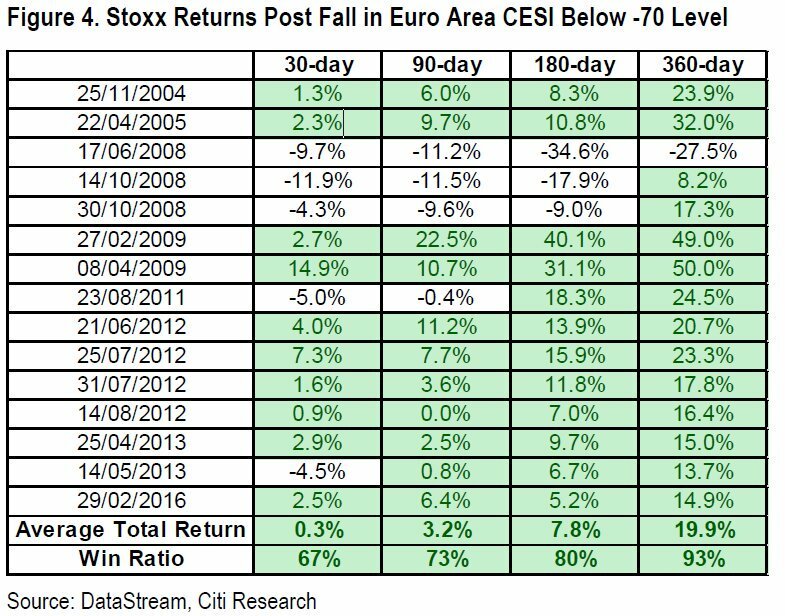 History shows that investors who bought European equities when ESI falls below -70 would have performed very well. Angela Merkel, Germany’s chancellor, has ended her long silence on the proposals for European reform made by the French president Emmanuel Macron. In an interview with a German newspaper at the weekend, followed by a speech in Berlin on Monday, she laid out her unifying plan for a divided continent. Divisions, it must be said, to which German policies and inaction have contributed. The chancellor is stretching out a hand not only to France, but also to Europe’s economically beleaguered south. Just as importantly, her plan is one that the more parsimonious and debt-averse northern Europeans can sign up to. With its emphasis on embracing technological change in a way that leaves no one behind, it is crafted to appeal not just to her coalition partners at home, the Social Democrats, but to future partners like the Greens. Ms. Merkel’s plan is an implicit apology for past German intransigence on economic policy, and signals that Germany wants to return to its old role as a bridge-builder. She promises a “respectful” approach to Italy’s populist governing coalition— a rebuke to earlier criticism of the Italian vote by German EU commissioner Günther Oettinger. Ms. Merkel accepts that Germany, Europe’s richest economy, needs to contribute more than others, while acknowledging that there is resistance on the part of northern and eastern EU member states to further integration. Her plan, unlike Mr. Macron’s impassioned calls for deeper reform, stands a chance of forming the basis for a new European consensus. In effect, Ms. Merkel is now fleshing out her announcement in a May 2017 campaign speech that we Europeans needed to “take our fate into our own hands” in the era of a rising China and Donald Trump. Europe, she says now, must “renew the promise of peace and security” to its citizens on three “existential” questions: monetary union, immigration and defence. Only then can it stand firm in defence of a rules-based world order. On the eurozone, Ms. Merkel still rejects any form of debt mutualization. Instead, she supports banking and capital markets union, as well as a “European Monetary Fund” with special new short-term emergency credit lines. She wants to use the EU budget for investments in growth and innovation in Europe’s more troubled economies. One of the fatal flaws of the euro is monetary integration without fiscal integration. While the Germans are not embracing full fiscal integration, these steps are nevertheless a positive sign that Europe can be saved. Watch for the European theatre to continue, but a relief rally to begin in the near future. While Europe may be a contrarian’s dream, China may turn out to be a growth disappointment. 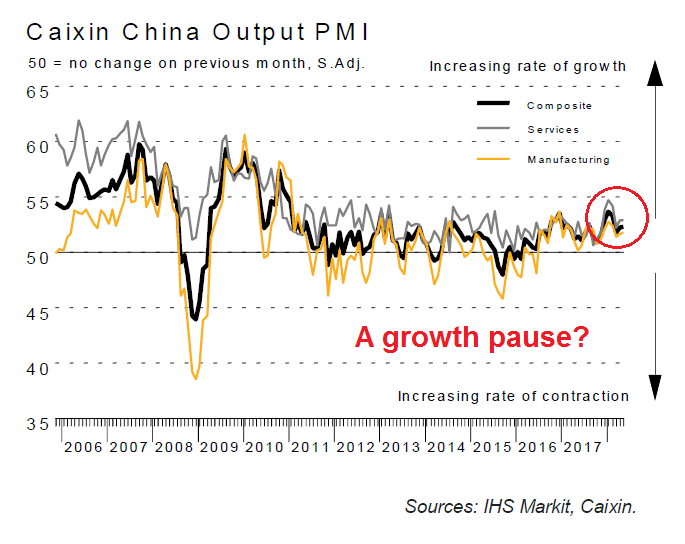 Evidence of a pause is beginning to accumulate, as evidenced by the latest Caixin PMI readings. Callum Thomas of Topdown Charts observed that both fiscal and monetary stimulus are tightening. Business Insider reported that Chinese credit growth has also been decelerating. 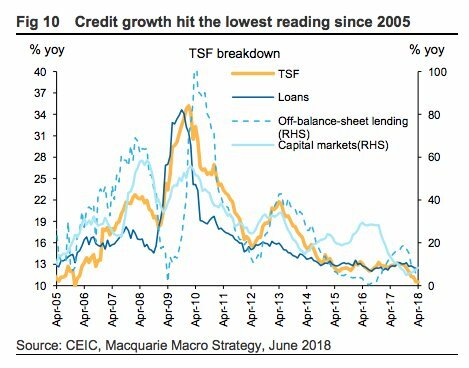 Chinese defaults also are rising, which is increasing credit risk in an over-leveraged economy. In addition, Bloomberg reported that Chinese banks have been selling their corporate-bond holdings and tightening credit to firms that buy the debt. These steps raise the risk of a doom loop of escalating defaults. As a result, the stock market of China and her major Asian trading partners have been mixed, characterized by indecisive price trends. Technicians can measure the pulse of a market by how it responds to news. The partial inclusion of China’s A-shares into MSCI indices barely moved the needle on stock prices. In the short run, that’s bad news for the regional stock market outlook. What can we conclude from our brief tour around the world? 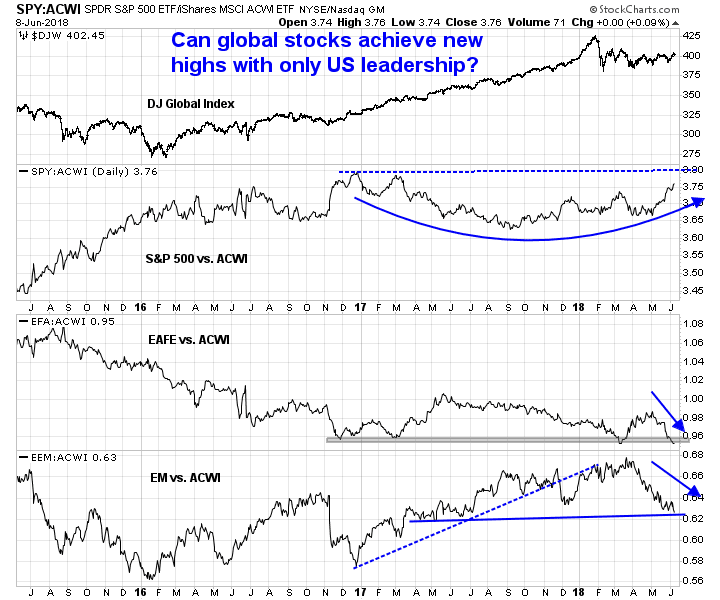 I interpret current conditions as strong US economic and equity leadership can provide support for stock prices. 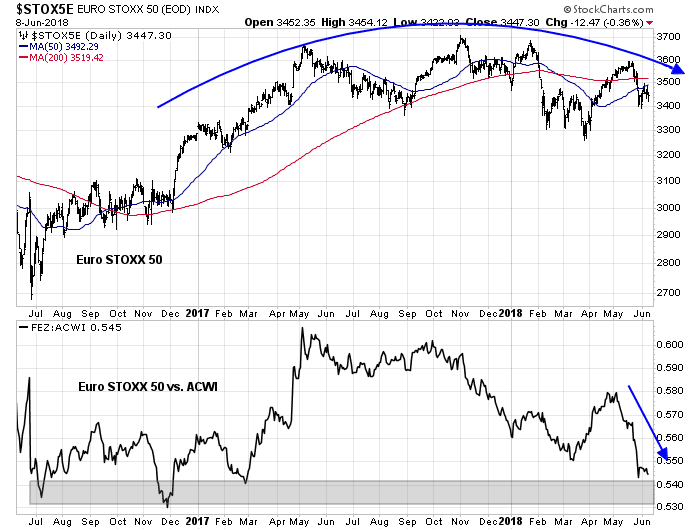 I would expect that European equities should recover in the next few months once investors get over their latest jitters. The wildcard is China. 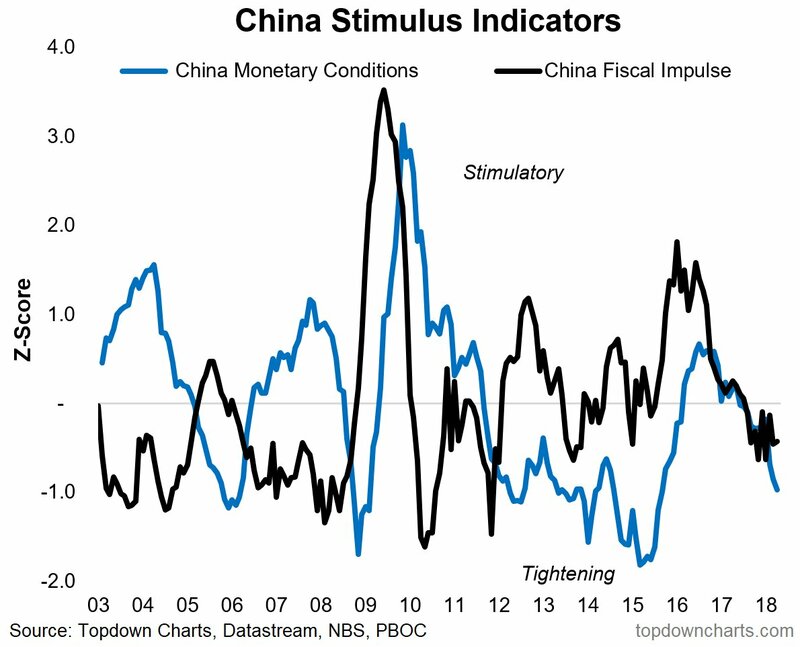 The Chinese economy is entering the downleg of a stimulus/tightening cycle of unknown duration and magnitude. While Beijing has lots of tools to cushion a hard landing, it is unclear how much pain the Chinese economy will have to endure before the authorities act. In short, as long as China doesn’t implode, expect fresh highs in the global market averages in the next few months. In terms of positioning, I am inclined stay long US equities, accumulate Europe in anticipation of better performance in the months ahead, and underweight China, Asia, and China related plays. Looking to the week ahead, the intermediate term outlook remains bullish. 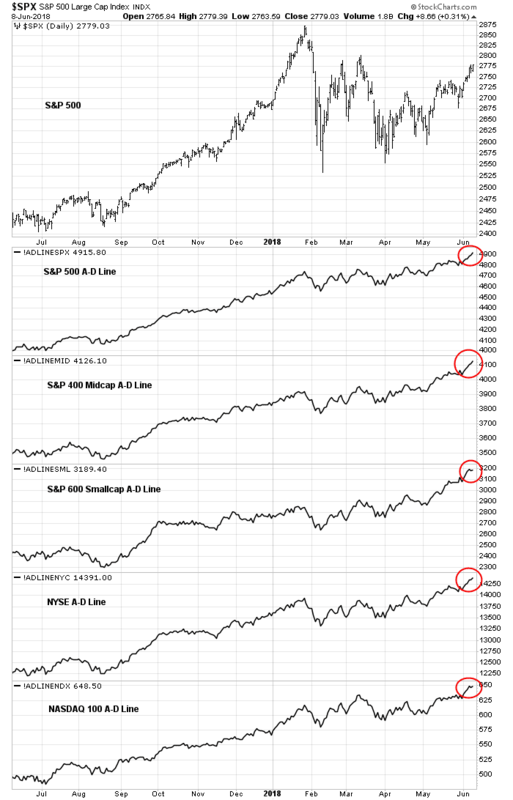 All versions of the Advance-Decline Lines, whether large cap, mid cap, small cap, or NASDAQ, have recently made all-time highs, indicating a bull trend. However, we may see some near term weakness. Subscribers received an email alert last Friday that my inner trader was taking profits on all long positions and had put on a small short. The sale of the long positions generated a notional 8.0% profit based on the buy signal flashed on April 23, 2018 (see My inner trader). 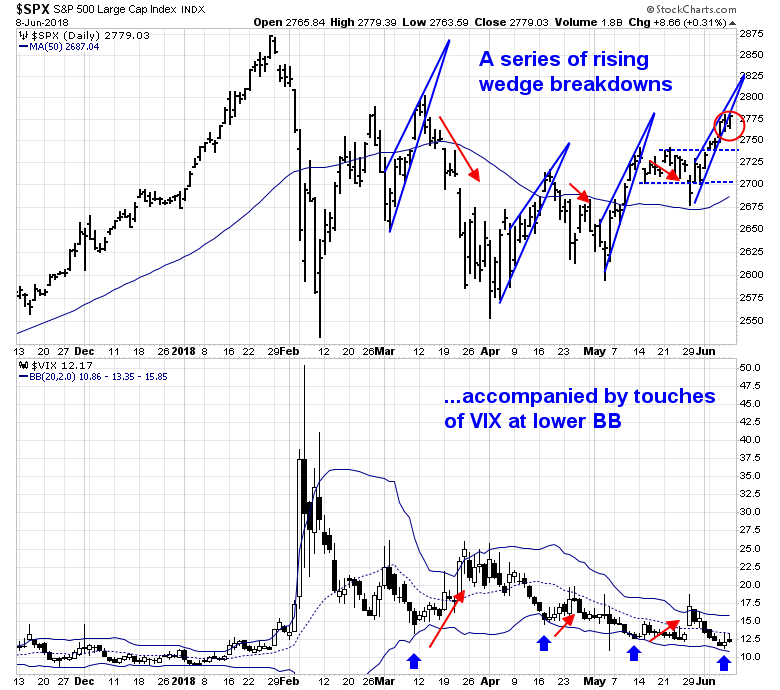 Since March, the market had broken down out of a series of rising wedges. Each of those instances was accompanied by the VIX Index either breaching or touching its lower Bollinger Band. The corrective phases of successive rising wedge breakdowns have been increasingly shallow, which is intermediate term bullish. The latest episode occurred Friday, as the market broken down out of the wedge but rallied up to backtest the resistance trend line. You can better see the break, rally and backtest in the hourly chart. The index tested the old highs and uptrend line while exhibiting a negative RSI divergence. The initial downside target is support and gap at about 2740. 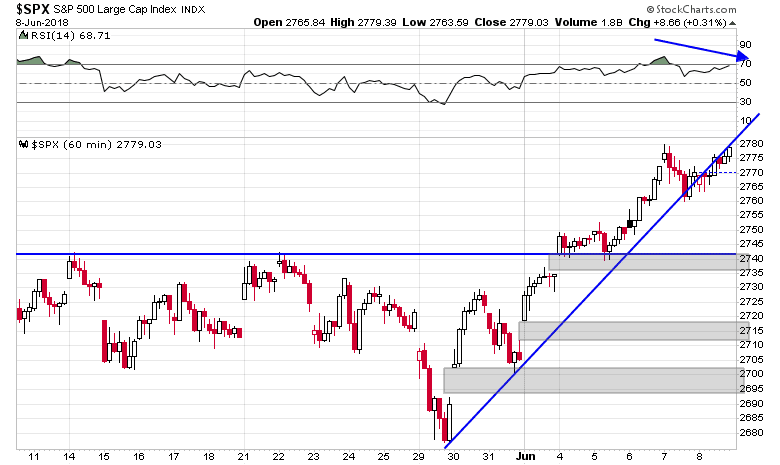 Further downside targets can be found at a second gap at about 2712-2718, and a third gap at 2694-2700. Next week will see a number of sources of event-driven volatility. We will have the US-North Korea summit on Tuesday, and the BoJ, ECB, and Fed will be meeting next week to announce their respective monetary policy decisions. Next week will also be option expiry (OpEx). 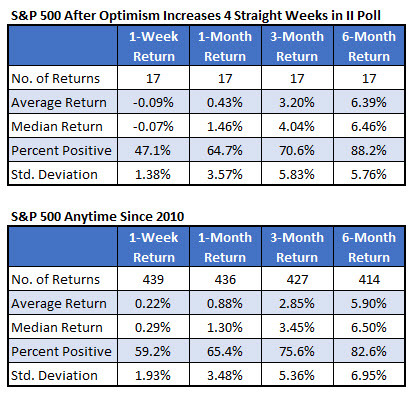 Historical stuies of OpEx week from Rob Hanna of Quantifiable Edges indicate June OpEx has seen subpar market returns, though the winning weeks still outnumber the losing weeks. 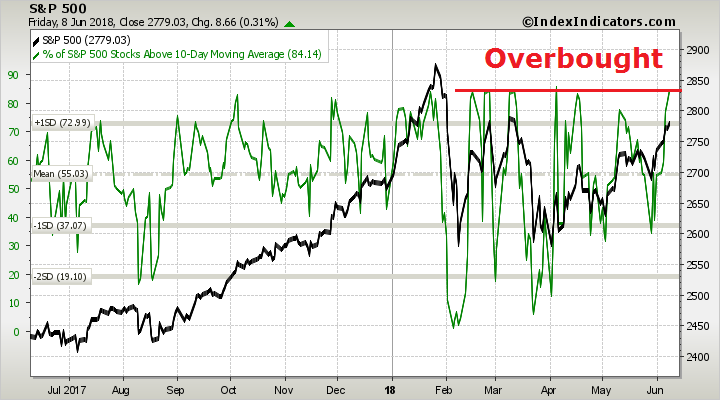 Short-term breadth indicators from Index Indicators show that the market is overbought and due for a pullback. Andrea Kramer at Schaeffer’s also observed that II Bulls have risen for four weeks in a row, and subsequent market returns have been subpar, though not disastrous. The peak-to-trough time horizon of past rising wedge breakdowns have lasted about two weeks, and that will be my inner trader’s working hypothesis for how a pullback may play out. He is nevertheless aware that the intermediate term trend is up, and successive corrections have been shallower and shallower. Downside risk at these levels is only 1-2% and therefore his short position does not represent a major capital commitment. My inner investor is staying long, as he is not interested in playing 1-2% squiggles in the market. Next How far can this rally run? 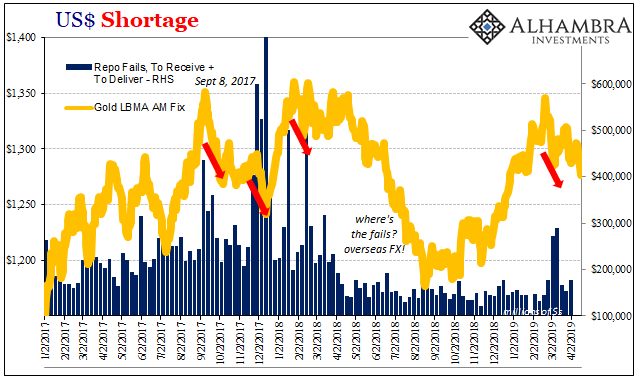 Oil Rigs: "Now, back to the Permian Show"